a push-to-cancel turn signal switch. Fred Hink/ Arrowhead Motorsports makes it relatively easy to do since the mirror mount already has a hole drilled in place. Simply tap the hole for a 6mm x 1.00mm screw, drill out the hole in the lever bracket for clearance for the 6mm screw, then remount. Look at the back of the enrichener and you will see a groove, which when mounted under the original switch, engages in a rib that keeps it from rotating. Determine how you want to position the lever on the billet mirror mount, then drill and tap a hole for a short 3-4mm pan head screw. This will keep the lever from rotating on the mount. Insert the 3-4mm screw in the mount, then mount the lever using a 6mm screw of the appropriate length. Due to extreme cold weather, I haven't completed the drilling process yet so I'm just using a ziptie around the metal cable end of the enrichener and the handlebar, and it works fine. The push to cancel turn signal switch is sold on eBay by a company called Cycle Analyst at a price of $79 and the item comes bundled with a new mirror mount and hardware to re-locate the enrichener lever. The price for the plug-n-play switch by itself without the mirror mount or enrichener lever hardware was $65 including shipping. Turns out the fella at Cycle Analyst also makes the switch conversion for Sport Tour. I already had a billet mirror mount so I called Sport Tour to inquire about their offerings and was told they would not break up the package (switch & enrichener lever conversion). The very same switch is also available from a company named Four Strokes Only. Four Strokes Only price is usually $59, but they are on sale now for $49. 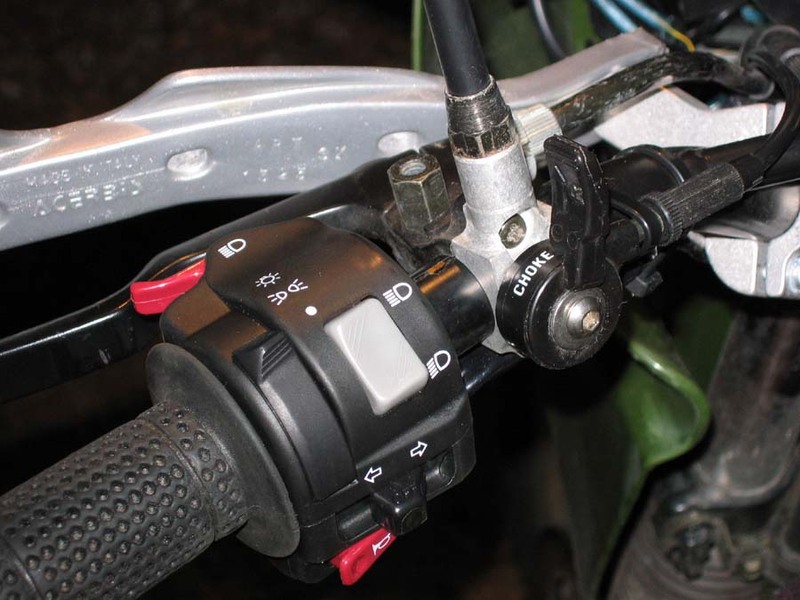 Their switches ARE NOT modified to work on the KLR. You have to do that yourself. For $10, I figured I'd let someone else do the mods, so I bought it from the Cycle Analyst fella. I'd like to add that if you haven't done so already, bump up the rating of the stock headlamp fuse. The "Outta my way" flasher has both headlamp filaments on simultaneously and there's a chance that the added current will pop the stock 10 Amp headlamp fuse. This page last updated 28-July 2007. Note: This is the same exact battery that Dual Star sells for considerably more $$$ ! !